Heat stress under record seasonal high early summer temperatures could trigger increased risk of an initial Alternaria attack in potato crops. Plants suffering from lack of moisture could prove more susceptible to pathogen infection, whilst soil moisture deficit will inhibit the uptake of nutrients, which could further stress crops during rapid canopy growth. Research has shown that stress is a key factor in enabling initial infection of Alternaria alternata to take hold in plants. Affected crops are believed to be more susceptible to the later infection of more devastating A. solani strains of the pathogen, according to Syngenta Potato Technical Manager, Douglas Dyas. “But the current weather conditions could trigger earlier infection, particularly in susceptible varieties if they are under stress,” warned Douglas. He advocated growers should start their planned Alternaria programmes with Amphore Plus, with the aim to take advantage of the product’s higher difenoconazole content to load up protection in the plant at the start of the risk period. Douglas pointed out that the active has been proven to be effective against inhibiting mycelial growth and development of both strains of the disease, but especially A alternata, compared to alternative active ingredients. 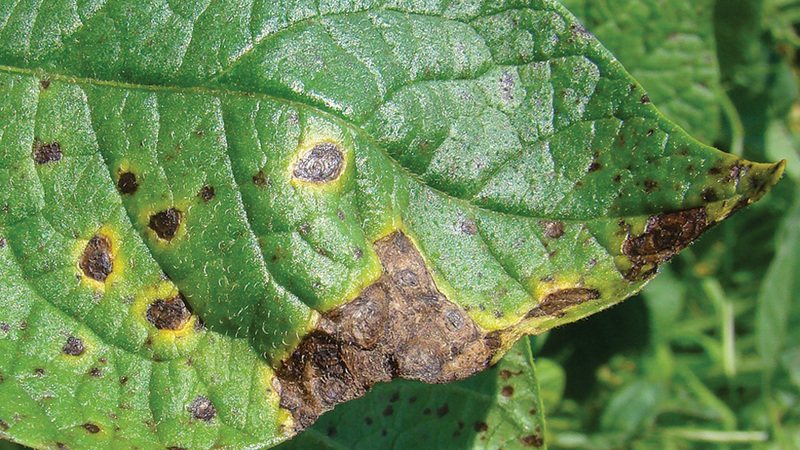 As the season progresses and if Alternaria risk persists, Douglas advised growers can switch to Amistar, targeted specifically at the later occurring, but typically more damaging, A. solani strains of the pathogen. Amistar can be tank-mixed with any blight fungicide pertinent to disease pressure at the time, he added. “Growers now have a full season programme available to tackle Alternaria. The key is to have protection in place before infection breaks out,” reported Douglas.